Palgrave Macmillan, , 288 p.
The contributions to this volume are united by a common interest in the practices that shaped 'science' in the early modern period, with a special emphasis on the ones bred by the emulation, competition, and conflict that encounters across the globe between different cultural and political entities generated. What it attempts is not simply another contribution to the relatively recent but already respectable tradition of 'science and empire.' 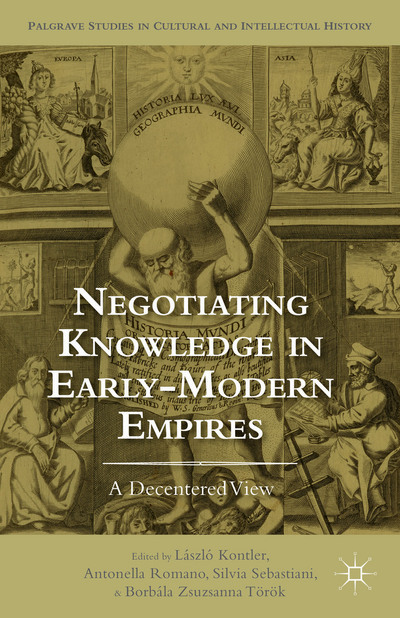 Rather than adding further nuance to our understanding of the routes in which the negotiations of knowledge between metropolises and provinces ultimately tended to determine the course of Europe's rise to world hegemony, or of the local dimension of western knowledge production, the volume takes a 'decentered' look at early modern empires. There are various ways in which such a 'decentering' approach is carried out in the individual contributions. All the chapters deal with European empires, but the angle from which this is pursued has been marked out by the lessons drawn from the non-Eurocentric studies referred to below. This focus is the result of both a contingency and of a state of the art: the contingency derives from the fact that most of the contributors are specialists of European empires; but, on the other side, we may acknowledge with regard to the period under consideration that historiography is still highly unbalanced. This is true not only if we compare European and non-European empires, but also if we pay attention to Europe itself, where the divide between the western and the eastern part of the continent has been overstressed by the 'great divergence' between western and eastern historiographies throughout the twentieth century. To some extent, this is one of the novelties of the volume: it builds upon an unconventional geographical set of cases, embracing the Holy Roman Empire, Spain, as well as China.